COMMENTARY ON "THE GREAT CONTROVERSY"
From an Adventist worldview, it is expected that a study on the book of Job would elicit an apologetic for The Great Controversy. In fact, the argument of this lesson is significant because it “proves” that Adventism uses the great controversy idea to interpret Scripture and to provide the structure on which to hang its entire worldview. The reason this clear admission is important is that Adventism claims its entire theological structure is based on the Bible, and yet this lesson demonstrates the lie underneath the deceptive words. Adventism is not based on the Bible; it is based on the extra-biblical revelations of its prophet Ellen G. White whose great controversy vision which she experienced in a church in Lovett’s Grove, Ohio, is their true foundation. Adventism carefully collects proof texts from Scripture to create an invented grid which they then claim is the truth about reality. On the contrary, unless one uses the Bible in context, interpreting its words using normal rules of grammar and definitions, one will create a falsehood. Proof-texting, rearranging biblical passages to create a picture that explains one’s “agenda”, is not using the Bible to know truth. It is using the Bible to deceive. Moreover, unless one is born again through believing the finished atonement of the Lord Jesus, believing that He became sin for us and fulfilled the law in His flesh, taking its curse and breaking its death sentence, we cannot understand Scripture. Adventism does not teach the true gospel; in fact, it uses the great controversy theme to avoid the biblical fact and implications of the completed atonement. Adventism needs to have a Jesus who died and rose but whose death did not once for all atone for human sin. It needs a Jesus who is shuffling around in a mythical building in heaven, whose perusal of the heavenly books is determining who has sufficiently perfected his character and remembered to confess his sins so those sins can be eternally destroyed by having Satan carry them out of heaven where Jesus’ blood carried them until they were investigated. Without the great controversy, Adventism would have no defense for its central pillar, the investigative judgment. Without the great controversy, Adventism would have to acknowledge that Scripture puts Satan in the position of an already defeated foe. He has power; he roars about seeking whom he may devour, but he is limited. God is not honoring his “free will”. God is sovereign over him, and God limits the damage he does. The great controversy model allows Adventism to fear Satan, to see him as an active force who is engaged in a struggle with his own Creator. Who will win?? The Bible teaches a very different picture. Satan is a rebellious creature who does not have free reign in the universe. He is on a tight leash held by the omnipotent God of the universe, and Satan is disarmed and humiliated already (Col 2:14-15). He is not the scapegoat; the Lord Jesus is. Only Jesus carries our sins, ever. Satan is punished for his own sins; he is not held responsible for ours. We are responsible for our own sins, and God is just in punishing sin. As we look at this week’s lesson, we have to start from this point: the book of Job does NOT demonstrate the great controversy. On the contrary, it clearly demonstrates God’s sovereignty and limits on Satan. It further shows us that Job the righteous had to repent, ultimately, of thinking he understood God and how the matter of His justice “worked”. Job repented in dust and ashes at the end of this book, retracting all he had said and admitting, “Therefore I have declared that which I did not understand, things too wonderful for me, which I did not know therefore I retract, and I repent in dust and ashes” (Job 42:3-6). 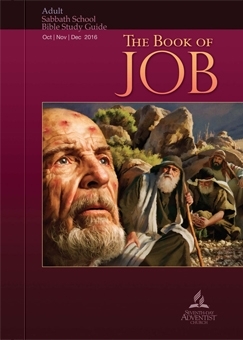 Job’s humility and repentance is the lesson Adventists need to learn from the book of Job. They do not understand how God works, and they give way too much power to Satan. God is sovereign, and His purposes are for our salvation, not for the defeat of Satan. While those questions lead to answers that are true, they do not address the situation of Job. Job did not take anything for granted. The fact that he sacrificed for his children lets us know he was constantly aware of sin and temptation and how it can derail one. What Job didn’t know was that God’s justice was not a simple cause-and-effect method of working. He did not fully understand that those whom God deeply loves may suffer and may even be given, as was Paul in 2 Corinthians 12, an “instrument of Satan” for their humility and their learning to trust God. Today’s lesson creates a scenario that sets the stage for the great controversy. It suggests that the scene in verse six of chapter 1 suddenly goes to a different place than earth. It says earth is presented as peaceful with a prosperous Job; suddenly the scene changes to a less-tranquil heaven It appeals to people’s fascination with science fiction, suggesting Job hints at things beyond the reach of telescopes. It says that God and Satan are not calm and tranquil but are having a confrontative conversation and concludes that Satan is challenging God in from of other “sons of God”. This entire day’s lesson is conjecture and imagination. The Bible never hints that a struggle is going on with God. It does clearly describe sin and rebellion, but it doesn’t put that rebellion in heaven while earth remains innocent, as Ellen White did. To be sure Satan was attempting to stir up trouble, but God was sovereign over him, and He is the One who determined how much Satan could do to Job. It was God, not Satan, who permitted Job to suffer and to see the bigger picture of trusting Him not just in prosperity but also in the deepest personal loss and suffering. Today’s lesson is laying a false foundation that leads the reader down an path the Bible never opens to us. The great controversy motif is not a template that helps us understand Scripture. Instead, it is a template that obscures the sovereignty of God over humanity and over Satan, His sovereignty over sin and His sovereignty over its resolution. The truth about the book of Job will not be able to be seen if one reads it through great controversy glasses. Ironically, Adventism gives Satan enormous power. They talk about him, focus on him, and insist he is a central player in the interpretation of the Bible. They deny that he must be feared, but they insist he is central in humanity’s struggle with sin. In fact, they create a straw-man argument to hide their exaltation of this demon. They say, as this lesson repeatedly points out, that Satan is real, and that “many people” view him as mythical but we must not fall to this deception. The choices are not between either disbelieving that Satan is real or believing in the great controversy. Rather, the bottom line we must face is whether we believe the Bible’s witness that God is sovereign over all creatures, including over our own and Satan’s supposed “free wills”. If we decide we don’t want a sovereign God who is as powerful as He declares He is, then we are unprotected against false gospels and Satan-saturated theologies. Of course Satan is real. The great controversy worldview is not needed to understand and believe this basic Scriptural fact. What Adventism’s great controversy denies, however, is that Satan’s Creator, God the Son, and indeed the whole Trinity, has absolute authority and control over Satan and is utterly in charge of us. He gives us commands to believe on which we must act, but concurrently He is sovereign. We cannot make these things “work” by creating a false system of belief. Ellen G. White talked about “the law of love” as the foundation of God’s government. She noted that because God does not want “forced obedience,” He therefore “grants freedom of will” to all His moral creatures. However, “there was one who perverted the freedom that God had granted to His creatures. sin originated with him who, next to Christ, had been most honored of God and was highest in power and glory among the inhabitants of heaven” (P.P. p 34,35). Ellen’s description of Satan before the fall is entirely mythical. Scripture never reveals these things. While Ezekiel 28:12-16 and Isaiah 14:12-14 are often used to apply to Satan’s rebellion, nevertheless they are specifically addressed to the kings of Tyre and Babylon. While these verses may be somewhat metaphorical ways to describe Satan’s fall, this interpretation is not explicit, and they also, in context, had a different purpose than that of describing Satan’s fall. To use the first chapter of Job to create a biblical explanation for what God has not revealed—the fall of Satan and the notion that we all have free will God is obligated to honor—is illegitimate. This confusing paragraph mixes law and grace and refuses to acknowledge that Jesus fulfilled the law, taking its curse, and breaking death apart so it has no more hold on those who believe. It misrepresents one of the most powerful passages in Scripture. The cross is not primarily about answering Satan. In fact, Satan has no role whatsoever in our salvation. The cross was about Jesus becoming sin for us so that we might become the righteousness of God in Him (2 Cor. 5:21). The cross was the place of complete atonement. There is no further atonement to be made; Jesus is not working in heaven to finish his atonement. It is finished! In this is love, not that we have loved God but that he loved us and sent his Son to be the propitiation for our sins (1 John 4:10). And we have seen and testify that the Father has sent his Son to be the Savior of the world (1 John 4:14). Then what becomes of our boasting? It is excluded. By what kind of law? By a law of works? No, but by the law of faith. For we hold that one is justified by faith apart from works of the law (Romans 3:19-28). The Bible is utterly clear that Jesus did not come to vindicate the law. He did uphold the law, but upholding the law does not mean retaining it as a rule of faith and practice for believers. Rather, upholding the law means that the law absolutely did what God required it to do: it exposed our utter inability to avoid sin, and it declared the death sentence for everyone who broke it. Jesus came and became our Substitute. He did not come to demonstrate the character of God so Satan would be proven wrong. He came because the Father sent Him, and He sent Him for one purpose: to be the propitiation for our sins. He came to appease God’s wrath against sin by being our Substitute. He took our sin imputed to Him and died the death the law required of all of us. He didn’t die to set aside the seriousness of sin; He died because only He was able to become our collective sin. He literally took our sin to the cross and in His flesh, He, the Logos of creation, the living law, fulfilled in His flesh the requirements of the law that demanded death for human sin. Jesus didn’t fulfill the lie by being good, although He did keep all its requirements. Rather, Jesus fulfilled the law by taking into Himself its curse of death leveled against every one of us. He fulfilled the death penalty that was at the heart of the law, so that now, we respond to Him, the One who fulfilled the law of sin and death, and submit to Him, receiving His blood as our Substitute. Then, we receive His Spirit, and He imputes to us His righteousness. None of this process of death, resurrection, and reconciliation has anything at all to do with our keeping the law. Rather, it has to do with His taking every consequence of that law into Himself and giving us His own personal righteousness in exchange for His taking our personal sin into His body on the cross. The cross does NOT resolve the great controversy. It is the way we are saved, and Satan was disarmed and defeated as Jesus hung and died. Satan’s claims against us have lost their power now because Jesus took our sin. Today’s lesson ends with a last argument for God’s battle with Satan and appeals to evangelical scholar Gregory Boyd for literary support. In fact, Gregory Boyd teaches a belief in God’s openness that denies His sovereignty. He teaches that there is a cosmic battle at the center of a “biblical worldview”. In conclusion, here is Paul’s statement of Satan’s current condition and of our security in Jesus. He is not battling Christ for our souls; he is a deceiver and a tempter, but he is not a heavenly “player”. The Lord Jesus is already the Risen Lord over all rulers, powers, and authorities! See to it that no one takes you captive by philosophy and empty deceit, according to human tradition, according to the elemental spirits of the world, and not according to Christ. For in him the whole fullness of deity dwells bodily, and you have been filled in him, who is the head of all rule and authority. In him also you were circumcised with a circumcision made without hands, by putting off the body of the flesh, by the circumcision of Christ, having been buried with him in baptism, in which you were also raised with him through faith in the powerful working of God, who raised him from the dead. And you, who were dead in your trespasses and the uncircumcision of your flesh, God made alive together with him, having forgiven us all our trespasses, by canceling the record of debt that stood against us with its legal demands. This he set aside, nailing it to the cross. He disarmed the rulers and authorities and put them to open shame, by triumphing over them in him (Colossians 2:7-15). Copyright 2016 BibleStudiesForAdventists.com. All rights reserved. Revised September 30, 2016. This website is published by Life Assurance Ministries, Camp Verde, Arizona, USA, the publisher of Proclamation! Magazine. Contact email: BibleStudiesForAdventists@gmail.com.